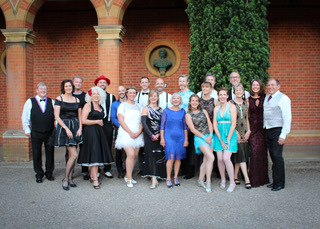 On Saturday 2nd July, 120 guests gathered at Wellington College, Crowthorne, Berkshire for an evening of glitz and glamour. We couldn’t have asked for better weather. There was a champagne reception in the beautiful grounds of the college before entering into the hall for a three course meal. Simon Butler-Manuel very kindly agreed to speak about the work of GRACE and take part in the dancing competition. Although himself and wife Lucinda had never danced before, they did an amazing waltz. 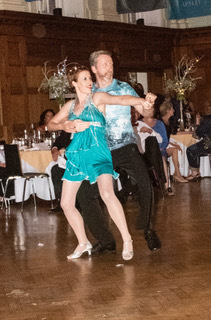 12 couples took part, dancing a range of genres. We had Jive, Charleston, Quickstep, American smooth and Waltz with a fabulous group dance at the end to finish off. The couples had been in training for 5 months. Some had never danced before, so to get up on a stage in front of 120 people in lycra and sequins was always going to be nerve racking! They did amazingly well and often got standing ovations. The winners (Katy & Mark Halsall) were over the moon when they took the trophy, as you can see on the picture. The MD for the evening was Murray Lindo who hosted the raffle. There were wonderful raffle prizes to be won and Karen & Kevin from Strictly Come Dancing very kindly donated two tickets with a meet & greet with them for the auction. Following the competition we had a 13 piece band play for 2 hours and everyone was on the dance floor till midnight. It was a huge success and we raised over £7,000. Massive thanks must go to the Wellington Community team, especially Sarah Connel, Lucy Taylor and Murray Lindo. From the word go they have been totally amazing, embracing and supporting this event. It wouldn’t have happened without you, heartfelt thanks. Wellington College, thank you so much for allowing us to use your beautiful School to host, it was the perfect setting.